Here are some of the credit card answers to questions that we see time and time again. Why do people use a credit card? Credit cards provide a convenient way to pay for goods and services, rather than with cash. A 0% credit card when used wisely can allow you to make a large purchase or transfer an existing debt and benefit from low interest rates for a limited promotional period. Yes, provided you are aged 18 years or older. No UK credit card company will accept applications from people under the age of 18. Are all credit cards the same? No almost all credit cards are different. Here at 0% Credit Card Expert we currently have over 90 UK 0% credit cards available. These cards are from different issuers with different 0% offers on purchases and/or balance transfers. APR is Annual Percentage Rate. This is the rate of interest that a credit card charges expressed as the rate over a year. The APR includes any fees and charges such as an annual fee. A credit card limit is the total spending limit that a credit card provider makes available to the customer. As a customer using your credit card, you can make purchases up to that spending limit or you can make a balance transfer for up to that amount. What does assumed credit limit mean? All UK credit cards have an “assumed credit limit of £1200” as part of their representative example. This representative example is a standard format that is used to to allow UK credit card customers to compare the typical interest rates on different credit cards. As part of this representative example an assumed credit limit of £1200 is displayed. The assumed credit limit is simply a common figure used to easily show the representative example in a common format. This assumed credit limit is not the actual credit card limit that a customer is likely to get. A customer could get a £3000 credit card limit or a £5000 credit card limit, for example. What fees do credit cards charge? Many credit cards will not charge a customer any fees when they make and pay on time for purchases using the card. Late payments to the credit card company will however attract a fee. If you make a balance transfer many credit cards will charge a fee for the transfer. This is usually a percentage of the total amount transferred. 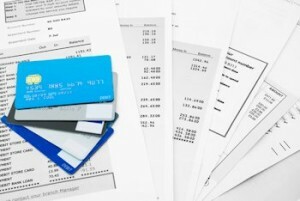 Some credit cards do also charge a credit card annual fee for using the card, but most do not. Do credit cards offer additional protection when making a purchase? Yes they do. One of the main benefits of using any credit card to make a purchase is that this will then give you extra protection under section 75 of the Consumer Credit Act. This means that if the retailer goes bust or you receive a faulty item, you may then be able to ask your credit card company for a refund of the purchase price. Visa and MasterCard are two separate payment networks that provide payment processing when a credit card is used to make a purchase. The M & S credit card, for example, is issued as a MasterCard credit card. However, Nationwide credit cards are issued as a Visa card. Both Visa and MasterCard are widely accepted at millions of locations all over the world.